Tendons are situated between bone and muscles and are bright white in colour, their fibro-elastic composition gives them the strength require to transmit large mechanical forces. Each muscle has two tendons, one proximally and one distally. The point at which the tendon forms attachment to the muscle is also known as the musculotendinous junction (MTJ) and the point at which it attaches to the bone is known as the osteotendinous junction (OTJ). The purpose of the tendon is to transmit forces generated from the muscle to the bone to elicit movement. The proximal attachment of the tendon is also known as the origin and the distal tendon is called the insertion. The tendon cells are known as tenoblasts and tenocytes. They make up approximately 90-95% of the cells within the tendon. The other 5-10% include the chondrocyctes, synovial cells and the vascular cells. Tenoblasts are immature tendon cells. Initially they are different in size and shape but as they age they become elongated and spindle shaped and transform into tenocytes. The tenocyctes are responsible for the turnover of maintenance of the extracellular matrix (described below). The tenocyctes respond to mechanical load of the tendon and thus make adaptations. They are arranged in longitudinal rows and have extensive communication with adjacent cells usually through gap junctions. Gap junctions are very complex and complicated structures. They have two hemi-channels. These are also called connexons (a collection of six connexin protein subunits). These have a central pore. The connexons in an open state allow metabolites and ions to pass freely between the gap junctions. The connexins are numbered, the ones which we are interested in for cell communication and tendon regeneration are connexins 26, 32 and 43. Tendons consist of mainly type 1 collagen fibres (but there are others present) and proteoglycan. 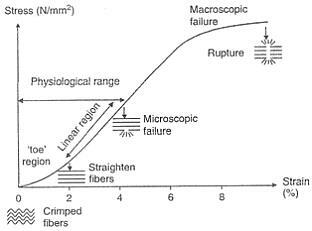 The type 1 collagen fibres are responsible for the tensile strength of the tendon whereas the proteoglycan are responsible for the viscoelastic nature of the tendon. The collagen molecules consist of polypeptide chains, three of these chains combined together form a densely packed helical tropocollagen molecule. Five of these combined together form a microfibril. The microfibrils then aggregate together to form fibrils. These are then grouped into fibres and fibres into fibre bundles and then into fascicles. The tendons’ main role is to transmit forces from the muscle to the bone and absorbs external forces to prevent injury to the muscle. As the tendon runs from a very compliant tissue (the muscle) to a ridged stiff one (the bone), this role can become very difficult, this can result in strain concentrated at the site of merging tissues. This can be a common site of injury. The make up of the tendon is now not thought to be the same throughout, research has discovered that the tendon itself may be more ridged in some parts and more compliant and elastic in others to overcome this concentration of strain and risk of injury. Each tendon will differ throughout the body depending on the rate in which they are strained. The behaviour of the collagen within the tendon depends on the intramolecular types, quantity and bond. The tendon collagen fibres at rest are now thought to be organised in a crimped patter, when the tendon is put under strain of up to 2%, the fibres and fibrils are thought to flatten. Any further the fibres are said to be pulled into a more parallel and linear pattern. ↑ 1.0 1.1 1.2 1.3 Kannus P. Structure of the tendon connective tissue. Scandinavian Journal of Medicine and Science in Sports. 2000; 10: 312-320. ↑ 3.0 3.1 3.2 Sharma P, Maffulli N. Biology of tendon injury: healing, modeling and remodeling. Journal of Musculoskeletal Neuronal Interact. 2006; 6 (2): 181-190. ↑ Goldberg GS, Lampe PD, Nicholson BJ. Selective transfer of endogenous metabolites through gap junctions composed of different connexins. Nature Cell Biology 1999; 1:457–459. ↑ Gwendolen et al, 2015, Grieve's Modern Musculoskeletal Physiotherapy, 4 edition, Elsevier, pg 107. ↑ Thomopoulos S, Marquez JP, Weinburger B, Birman V, Genin G. Collagen fiber orientation at the tendon to bone insertion and its influence on stress concentrations. Journal of Biomechanics 2006; 39(10):1842–1851. ↑ Petersen W, Pufe T, Kurz B, Mentlein R, Tillmann B. Angiogenesis in fetal tendon development: spatial and temporal expression of the angiogenic peptide vascular endothelial cell growth factor. Anatomy and Embryology 2002; 205: 263–270. ↑ Lephart SM, Pincivero DM, Giraldo JL, Fu FH. The role of proprioception in the management and rehabilitation of athletic injuries. American Journal of Sports Medicine 1997; 25:130-137. ↑ Ackermann PW, Li J, Finn A, Ahmed M, Kreicbergs A. Autonomic innervation of tendons, ligaments and joint capsules. A morphologic and quantitative study in the rat. Journal of Orthopaedic Research 2001; 19:372-378.